I want my sport back. Seriously. And not the old days when just about every game in Major League Baseball was played in less than 2 1/2 hours. We're not talking 1977 here. I'd be happy for a return to, oh, 2009. Yes, everybody is supposed to hate commissioners, but I'm rooting for Rob Manfred's attempts to fix what's wrong in baseball. There's nothing wrong with change. And the game suddenly needs a lot of it. For all of us who love the game and recoil in horror when a nonbeliever says baseball is boring, it's becoming harder to argue the point. Did you know there were more strikeouts than hits last season for the first time in history? We're talking 41,019 hits but 41,207 Ks marked on scorecards. The trend is quickly getting worse as strikeouts rose for the 11th straight year. The alarm bells were really sounded in this view last season by legendary baseball writer Jayson Stark, who will receive the Spink Award this summer at the Hall of Fame for his decades of work at the Philadelphia Inquirer and ESPN.com. Stark, who now writes for the Athletic, warned us months before the season ended that 2018 was likely to have nearly 10,000 fewer balls in play than 2009. In 2009, the postseason ended with the Yankees' fascinating six-game World Series win over the Phillies. That year, batters put 130,217 balls in play, according to sports data hound Chuck Bannon of Qlik.com. To do the math, you follow his formula: Balls in play = (At-bats + sac flies + sac hits) - (home runs + strikeouts). For last season, my calculations came up with 120,673 balls in play. The difference is 9,544, darn close to Stark's forecast. That's far too much time where the game is the pitcher, the hitter, the catcher and nobody else. Attendance was down more than 4 percent from 2017 and was 9.8 million less than 2007. And don't blame spring weather. Television ratings for the postseason cratered, even with a Boston-Los Angeles World Series. Prices keep going up. Entertainment is going down, and fans in plenty of cities feel their team has no hope to win, or maybe doesn't want to win. That's a deadly combination. Guys like Rangers slugger Joey Gallo give you a good idea about what's wrong with the game these days. Gallo, 25, broke through as a regular in 2017, playing 145 games. He belted 41 homers and had 80 RBIs while batting .209 with 196 strikeouts. He had just 94 hits. Similar numbers last year: In 148 games, he had 40 homers and 92 RBIs. But there was that little issue of a .206 average and 207 strikeouts that kept his hit total at 103. Two years in a row, according to FanGraphs, Gallo has had the worst contact percentage on his swings in the big leagues. Last year, the number was just 61.7 percent. If organizations think all-or-nothing players like this are really what they want, they're doomed to fail. Manfred is most concerned with pace of play and getting the game moving. And with an average game time of 3:05 last season and only one game the entire postseason coming in under 3 hours, he's right. Manfred has given up the use of a pitch clock for now, but bet on it showing up in a new basic agreement sometime around 2021 or 2022. We've seen the pitch clock work in Triple-A and it's barely noticeable now, other than keeping game times manageable. In addition to speed of play, we need to see more offense. The overall batting average last season of .248 was baseball's lowest since 1972. We need the DH in the National League. Yesterday. Enough of watching pitchers flailing away. That's not strategy. Kids specialize in pitching in high school these days, and we want them to suddenly hit in the major leagues? For some warped tradition? Manfred will make that happen over the howls of NL purists, as he should. He hasn't attacked the defensive shift as vociferously yet, but he should do that, too. It's a scourge. Left-handed hitters, in particular, are vulnerable to losing all kinds of balls pulled to the right side that would have been hits a few years ago. Guys aren't wired to dink a ball down the third-base line because no one hits like, say, Wade Boggs did. The shift and the emphasis on home runs has created an environment where launch angle is king and batters are trying to lift the ball over the defense rather than the hit-em-where-they-ain't strategy we grew up with. And if you're trying to undercut the ball to hit it over the defense — or over the fence — what are you more likely to also do? Swing and miss. Here's one possible fix: Draw a vertical white line from second base to the top of the dirt. You have to have two infielders on each side of the line. Period. None of this three guys on the right side, with the second baseman in short right field and the third baseman standing behind second base. You say the shift is strategy. I say that's not baseball. We want offense, we have to cut way back on the shifts, which we're seeing now at Bisons games because scouting reports on prospects have filtered down to the minor leagues. The independent Atlantic League is testing rules this year in conjunction with MLB and two infielders on each side of second is one of the changes. There's more that can be done. The Atlantic League also is moving the mound back two feet. Someday, MLB may have to lower the mound like it did in 1969 to help offenses. How about the proposal that pitchers must face three batters? It would effectively be the end of the LOOGY (left-handed one out guy) that is now a fixture in every bullpen but causes delays in the game with interminable pitching changes. We only had 42 complete games last season. Starting pitchers averaged less than 5 1/2 inning per start. Every guy comes out of the bullpen firing 95 mph and they're always fresh. Bad news for offense. The Rays started the trend of "The Opener" last year and the worst thing that happened was they won 90 games. Now even the Yankees rumbled in spring training about going the route of piecing a game together with relievers at times rather than a No. 4 or No. 5 starter. 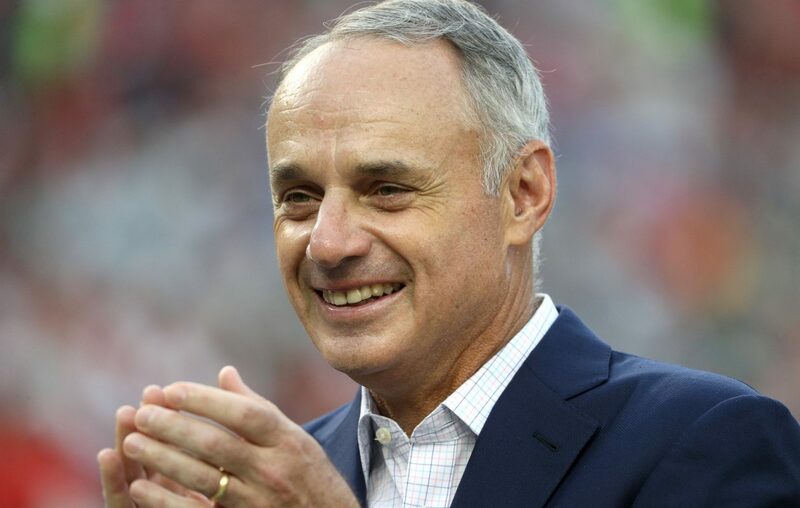 "Repeated pitching changes obviously take a lot of time," Manfred said last month following owners meetings in Florida. "They affect the pace of the game. That's one rationale. I think the idea of relievers having to go longer is appealing in terms of promoting the role of the starting pitcher, encouraging pitchers to pitch a little longer at the beginning of the game. You talk about player marketing. Historically, some of our biggest stars are starting pitchers, and you want to make sure those big stars are out there long enough that they are marketed, recognizable." Manfred also needs some anti-tanking initiatives. Reward teams who come close to the playoffs and just miss, and don't reward the teams clearly hoping to lose 100-plus games to get top draft picks. That damages fandom in cities with decades of great tradition. What's there to watch this summer in wonderful baseball towns like Baltimore, Detroit or Kansas City? And don't get me started on what's going on in Miami. Exactly. Maybe the worst thing to happen to baseball was the back-to-back World Series titles by the Cubs (2016) and Astros (2017). In those two long-suffering markets, the championships were a celebration after decades of waiting, but it gave too many other teams the idea that tanking is the quick fix to winning. And while the Cubs and Astros both acquired high draft picks because they were terrible, they actually became winners by augmenting Kris Bryant, Javier Baez, George Springer, Alex Bregman and Carlos Correa with savvy moves around them. In Chicago, think of Jon Lester, Jake Arrieta, Aroldis Chapman, David Ross, Ben Zobrist and Addison Russell. In Houston, ponder the acqusitions of Brian McCann, Carlos Beltran and Justin Verlander. The international free agent signing of Jose Altuve. It's not remotely all tanking. It's a problem. It seems baseball is full of them these days. Good luck to Manfred fixing them all and keeping labor peace with the players. He has lots of hard work ahead.